‘This’ was the most groundbreaking CGI movie ever. The first film ever to use computer-generated effects to create an immersive 3D world, Tron would help blast cinema into a new digital age where a man could fight gladiators in ancient Rome, transform into a liquid metal cyborg or bring a toy cowboy to life. Wyatt Earp was puzzled alright. Weirdly, the run-up to Tron involved an elephant lifting weights, a crocodile doing the high-jump and a bird on the parallel rings. Back in the late 70s, Steve Lisberger was a 25-year-old animator making TV commercials and animated spots for Sesame Street. His latest gig was The Animalypics, a spoof of the 1986 Olympics. Neither could Lisberger. After 36 outlines and 18 rewrites, Lisberger finished the screenplay that would baffle Boxleitner. It was The Wizard of Oz in cyberspace. After hacking the corporation that stole his videogame ideas, a hotshot programmer finds himself sucked into a gladiatorial virtual-reality inside the corporation’s evil Master Control Program (MCP). “Our script was entirely storyboarded,” says Lisberger. “We’d figured out we wanted to film it in live action and combine it with computer animation.” He spent $300,000 developing Tron and secured $4 million budget before realising he need Hollywood help. But that was the clincher: Disney didn’t have a clue about much. Once upon a time, they’d led the special-effects charge with amazing big-screen fantasies like 20,000 Leagues Under The Sea . Now they had Herbie . Young people weren’t interested in a sentient beetle, they were pouring their dollars into Arcade machines instead as the videogame craze swept America. The Mouse House needed something. Whatever it was, Tron looked like something. Giving $10 million to a first-director to splash on techniques that had never been attempted made Disney understandably anxious. Lisberger shot a dazzling test-reel in which Frisbee champion Sam Schatz blasted robots from Disney’s 1979 sci-fi flop The Black Hole . The technology worked. The symbolism was clear. Tron was a go. Many Disney animators refused to work on the movie, fearing that computers would put them out of a job. They were right – but it would be another 22 years before Disney closed its hand-drawn studio in favour of CGI animation. But Lisberger had his dream team. Blade Runner ‘s legendary futurist Syd Mead created Tron’s vehicles, including the light cycles, tank and the epic ‘Solar Sailor’. After designing sets and costumes, French comic-book genius Jean Giraud, aka Moebius, re-storyboarded the entire film. “The combination of those two was just beautiful,” says Lisberger. “Syd is so futuristic and stylish in such a severe way and Moebius’ work is so spiritual and charming.” They would create a fully CG world – every background, every vehicle – populated by live-action human characters. But casting those human characters wasn’t any easier. Boxleitner signed up as soon as he heard Bridges was on board (“My god. Really? I’ll do it!”). Lured by talk of a huge special-effects thriller with motorcycle chases and tank battles, Brit thesp Peter O’Toole had been lined up to play Sark, head of the evil corporation. He was imagining Star Wars. He turned up to find a black screen and nothing else. “He wanted to know where the tanks where!” laughs producer Donald Kushner. Goodbye O’Toole, hello David Warner. But first, every single frame of the 75-minute movie was blown up to a 14-inch print and colourised using gel-paint for the glowing elements. “We treated live-action footage like individual animated cells,” says conceptual designer Richard Taylor. It created extraordinary neon effects. And it would never be done again. Truckloads of sheet-film and more than 500 people (including 200 hand-painters in Taiwan) were needed for the agonising post-production. Which is exactly what they did. “We gave these computer guys six rows of handwritten numbers for every frame. And they hand-programmed them in! They typed them in!” This was 1981. There were no USB drives. Or floppy disks. 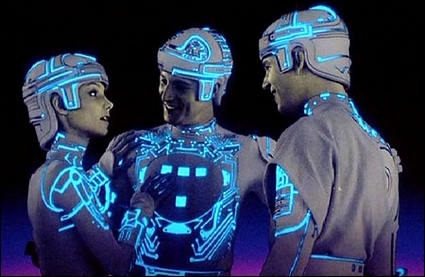 Tron contains just 15-20 minutes of CG, but it was a staggering amount – nobody had ever attempted it before. The one-of-a-kind computer used to create Sark’s carrier was as big as four deep-freezers put together. Disney thought they had a sensation on their hands. They predicted at least $400 million at the US box-office. In the end, Tron’s arcade videogame out-grossed the movie itself. Losing a blockbuster head-to-head with Steven Spielberg’s ET in the summer of 1982, Tron grossed just $33 million. Everyone agreed on one thing: Tron’s CG special effects were utterly groundbreaking. So groundbreaking, in fact, the Academy Awards refused to nominate them. “They said we cheated!” says Lisberger. “Which in the light of what’s happened is just mind-boggling.” Seven years later, James Cameron’s The Abyss won the Best Visual Effects Oscar for using the same technology..
Inked by Lost writers Edward Kitsis and Adam Horowitz, TR2N sees Bridges and Boxleitner reprise their roles, with Troy’s Garrett Hedlund starring as a man pulled into the computer world like Bridges’ character three decades ago.